Mention the name Leonard Cohen to anyone of a certain age and you’ll either get ‘Wow, what an amazing songwriter he is’, or ‘Oh God, he’s so dreary and depressing’ and one will never convince the other. Canadian-born Cohen is a deep thinking songwriter with an acquired-taste voice, but love him or loathe him, he’s a fine songwriter. This week’s subject is one of his mid-sixties compositions about a love affair but not of the physical kind. “Every man was in love with Suzanne,” he once said of the track, but who was she and how did she come to attract his attention? What’s even more astonishing is that he didn’t even record it first. As I mentioned in the Bird on the Wire piece back in March, Leonard was born in Quebec in 1934 into a wealthy and much respected Jewish family with one of his grandfather’s being a rabbi and the other being the founding president of the Canadian Jewish Congress. Leonard’s father died when he was nine, so he never got to know him. Once he’d finished the song he phoned his friend Judy Collins and sang it down the phone to her and she loved it. She recorded it first on here 1966 album In My Life. 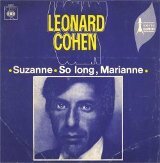 Leonard recorded it later and it appeared as the opening track on his debut album, The Songs of Leonard Cohen in 1968. Other artists who have recorded it include Joan Baez, Neil Diamond, Nina Simone and Abba’s Anni-Frid Lyngstad. In a 2008 interview with The Guardian, Suzanne explained, “I left Montreal for the States in ’68 and when I came back people said, ‘Have you heard the song Leonard’s written about you?’ In my wildest dreams I didn’t know it would be huge. I felt flattered, but I also felt there was an invasion of privacy. After that, things changed course. I stayed true to the 60s. He became this big pop icon and was not accessible any more. It hurt.